Parts of this book will irritate people AND there are parts of this book everyone needs to hear! I want to thank the author, Brene Brown, for eloquently putting into words backed by research a poignant and timely message for our polarized society of high social anxiety. She writes courageously and vulnerably. Be warned, she swears and rants and also tells some powerful stories. When I first read parts of this book, I thought about all of the places where systems of which I am a part are stuck in echo chambering, polarization, inability to listen or hear, inability to nuance, and dehumanizing behavior. One place is in our denominational conversations about sexuality, I thought, “the Reformed Church in America needs to hear this!” and I cheered when I heard our interim General Secretary (as I watched the streaming) read portions of this book in his speech to the General Synod. 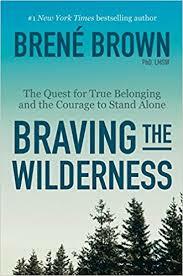 As the subtitle “the quest for true belonging and the courage to stand alone” suggests, the book establishes the need we all have to belong and explains that our journey to belong starts inward, not outward. When we open ourselves in vulnerability to others, drop our defenses, truly listen with curiosity, learn to hold the pain and joy of others, refuse to accept the false dichotomies and polarizations, and speak our nuanced understandings amidst the pressure we will create the kind of society in which we all want to be a part. It will not be easy. We will all have to “brave our own wildernesses” to get there, as we each do our own work so that we can collectively create communities of true belonging. Brown dismantles the inappropriate and unfulfilling ways we have been going about searching for belonging. This includes through “common enemy intimacy” where we are bonded through hating the same things. This and other “sorting” behaviors where we spread fear, anxiety, and common animosity leave us more disconnected and lonely and creates false community. This is just a taste of a rich book, full of wisdom. We will be using parts of it during our summer series on “Belonging” along with the Heidelberg catechism, scripture, and other sources. Why am I sharing this on the church blog? Because we at the Schoharie Reformed Church have done a lot of really good work at creating a community of true belonging, marked by authenticity and vulnerability for several years now. We are a diverse community that welcomes all. We recognize Christ as our unity and recognize diversity of perspectives as a gift within our midst. We are not perfect. We will disappoint. We will get hurt, angry and frustrated with each other at times, however, we are committed to gospel ministry in and with each other in “Living in Love and Growing in God.” This means we work at working it out. This means we believe we are better together. This means that we sometimes agree to disagree on really “big” issues. The difference is that we keep the conversations going, we keep working together, we keep listening, we keep sharing, we keep respecting each other and seeking the best for each other. Some argue that this is not possible to hold tension on the “big issues,” that we are somehow weak, or that we do not stand for anything. We say back, “YES IT IS POSSIBLE!” It is hard work! It is relational work! Christ and the greatest commandment are our core identity. As we see it, this is good news for our community and the world. This is gospel ministry. We invite you to come join the good hard work!